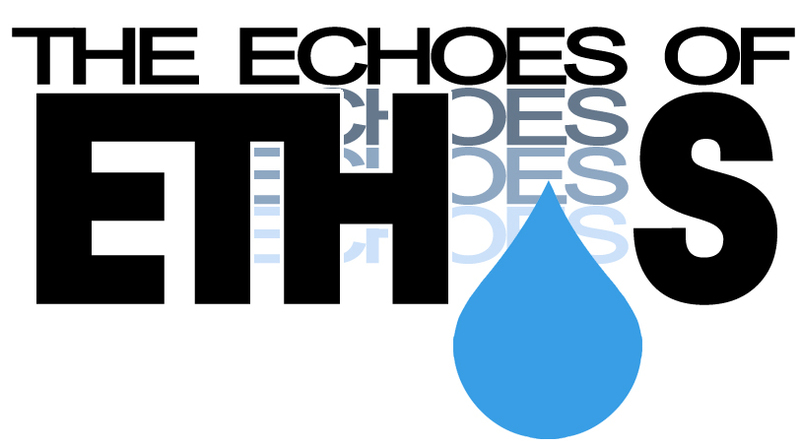 The Echoes of Ethos is a short story that I wrote about a group of people in the antediluvian era who struggle to survive the deluge as it rains its 40-day destruction of earth. It centers around a man’s last thoughts about the world as he waits on the precipice of death atop a sinking island with little else to do but reminisce on his life and reconsider the angels’ gifts to mankind. Drip. Drop. With two words uttered from the gods above, our world crumbled. Sitting here on the last of the landmasses as the shorelines tighten in around this tiny brick tower that used to sit atop our highest mountain, time affords me all but one thing; thought. That was my job, to think. They used to pay me for this, back one month in time when money was still worth something. My entire life was spent solving problems, assessing financial risks and bracing the balance of our long gone economy in the advisory board of the civic treasury council, but as soon as that first drop drizzled down the side of the crown prince’s bedroom windowpane, they moved me up a notch. They say that the world was originally formed from and by this same water, the same water that is now slowly devouring everything we thought we knew before our very eyes. Not a thing remains to be touched that isn’t drenched with the gods’ wrath. Even the air itself is damp. My fingers clench to the grass along these crumbled bricks to keep from sliding back down into the mouth of this monstrous water as it climbs up after me. The great devourer descended from the heavens above. It was born as small as a fingernail, but in one hour, it was a puddle, then a pool, then a pond, and once night had fallen, it crawled out of the ravines and began to invade the city streets. It’s been thirty-nine days since then and all that remains to be seen is the last few hills of land dispersed across the watery stretch of its skin. Every time the thunder and lightning rages forth, I can see the silhouettes of my home deep under the face of the waters. The hospital where I was born is now home to all manners of strange creatures. Samamoth, those vicious dragons that we used to taunt through steel bars, now seem to be taking the lead as the dominant race, along with every other gilled and finned beast. Even now, I can see there bulged eyes poking out of the waters around me, waiting for the waters to permit them access over my tiny strip of land and make the last of our kind a mid-afternoon dessert. Thirty-nine days ago, when Crown Prince Bezmus called me into the assembly with his ineffectual board of supposed know-it-alls, he asked only one question, “Where is Yazayel?” He asked this question to save himself a long line of related questions about the sudden disappearance of our divine teachers. Yazayel was in charge of them all, the one that first came down from heaven and taught our forefathers everything we needed to know in order to construct our paradise, but the longer time went on without any news of his whereabouts, the higher the crown prince’s tendency to snap on his envoys and put them to death became. His father, the king, was a cruel leader, so the real tragedy in his recent head injuries wasn’t so much that he was losing his mind so much as it was that his inability to function as king suddenly left little Bezmus with the full weight of his responsibilities. It might’ve been a blessing on him if it weren’t for the fact that his divine teachers had mysteriously vanished just as the gravest crisis to ever befall this world began its course. There were no answers and nobody to ask questions. A week before it all began, an eclipse had sundered the land with an earthquake by which deep cavities in the earth opened up to give us all a glimpse into the nether regions where our world was soon to be swallowed in and destroyed. Many said that they had seen Shamashael, who had once given us detailed information about the sun, lamenting against a tree in the forest and clawing the bark into his fingernails, for he knew more about the eclipse than was apparent. The entire east bank then gathered around the remains of an office tower where the earthquake had claimed the life of one of his children. Many who were unaffected by the quake shook from head to toe when they saw the giant lying at the base of the tower with no pity from the gods to keep his heart beating. Rumors were born and they quickly learned to travel far and wide. The people wanted an answer from their leaders, who wanted an answer from their teachers, who had no word from the gods above and fled from civilization to watch us perish from afar. It was my task to work with whatever they had left us with and resolve the riots by deducing logical explanations that would ensure a sense of security that we could all rely on, but my life was on the line, so when the time came that I couldn’t produce results, I lied. The council of the royal administration cushioned my seat and treated me as one of their own, but I knew by the hell in their eyes that I was nothing more than an expendable asset. I gazed down upon the anarchy rising outside our windows with nothing but lies to satisfy them with. At the time, I might have been the only one who realized the growing validity of the rumors. Two days before the destruction began, Bezmus was charging his guards to intimidate the crowds by grabbing anyone who proclaimed the words of the prophets and pulling them off to the side to be executed. This had been legalized the very day that it began, so no one understood why this was happening and there arose an even greater upheaval. What could the crown prince do against the public without the help of Yazayel, who had been with him in the palace since before he was born? It would have been fifteen years to the day last week, his birthday, which he spent digesting in the belly of a Samamoth. There has not been a breath of warmth in weeks. The skies have suffocated in the thick haze of water for thirty-nine days now and I can hardly move the stiff hinges of my fingers as they curl together like the crumpling legs of a dead spider. “How much longer will this go on?” We’ve asked ourselves over and over again. Beneath my hands and feet, our idols crumble into the tiny cubed blocks from which they were made as I struggle to seek higher ground on this godforsaken sliver of land. On the eighth day after the waters fell, we had summoned dancers to appeal to the gods on top of the altar square in the middle of the city, but they were not seen or heard. They danced and danced until the waters of the twelfth day swept them off of their dancing feet and washed them all away. As the waters grew hour to hour and swallowed the buildings up to their waists, we desperately wondered what we had done to deserve such a catastrophe. Which of the gods had we grieved? How much more should we have done for them? On the seventeenth day that the waters came, we were quickly escorted up into the highlands where the servants of the shrine cried out over the landscape before them as it swept death over every building and every home. I turned back to watch for a moment as the ground opened up and collapsed a vehicle manufacturing plant like it was cardboard box. Machine parts vomited out the side of the windows like iron innards with electric wire entrails lighting its passage into the vacuum of earthy darkness. Tiny people gathered on the roofs to start fires under large canopies, but the skies had no intention of holding back its tears, and we knew that they would all be reduced to a cluster of bubbles trickling to the surface by sundown. I continued to follow the royal entourage up into the rocky heights of the northern village where there was supposed to be prepared an escape craft that could withstand the weather. The windmills here were torn down like dirty rags and many of the houses that had been founded on the side of the hills were already gone and taken away by the rush of runoff water. We hastily took refuge inside the astral observatory, setting up for the night in hopes that dawn would bring us our first glimpse of light through those deep sullen clouds, but there was no sleep to dream. The lightning kept us all up, illuminating the room and all of its tall brazen statues of Kakabel, who had given us advanced astrology and promised that it would guide us to glory. But, now that the stars have all vanished, so has he. Ezelamel once told us that a massive barrier of water was suspended above the sky to protect us from the rays of the sun. It was created to sustain a high level of cellular regeneration within our bodies in order that we may live long and healthy lives, but now, its withholders have let the barrier collapse and destroy us. Everything that used to come to us as a blessing has suddenly turned to devour us without mercy. Even if anyone survives, what will things be like with no more than a single century of life? If that prophet from the posters really did build a gargantuan vessel, how will his future generations be able to carry on everything that we had accomplished? The world is over, lost in the waves. Every last motor and microcircuit has been flushed into the chasms of the earth. The synthetic yarns of our civilization lay entombed beneath a thousand sheets of sediment and silt. The laughter and the triumph of the days of technology are heard no more. Two hundred and fifty years ago, we converted our money to paper bills, a decision which ensured that our quickly dissolving shreds of currency would be remembered about as much as the fine sands of a desert recollect the rock from which they were all once a part of. Traveling from one quickly sinking patch of land to the next had been the key concept for days, but by the twenty-sixth day of our desolate search for higher ground, we had been scattered in the storm, each vessel to a different isolation of land. The crown prince, however, had washed up on a narrow belt of sand too far from the next shore to swim and too small to hide from the underfed pack of Samamoth that had heard him exhausting his lungs calling for help. We tried to protect the royal bloodline, but it was the human bloodline that was imperiled. My group of five was among the last in the entire region at that point that had managed to stay above water. There were only about twenty or thirty more people when we arrived at the edge of the grassy hills. Some of them came down to help us carry our vessel to the uppermost cliffs where they had built shelters and tents. Now that a greater amount of water had settled around us, it took slightly longer to drown out what was left of the land, so we finally had a little time to think and gather our thoughts, but not much. Our food was rationed to anyone who contributed to our discussions or helped build more vessels. With no time to waste on sleep, time became as precious as anything we had ever known. It became like the way we used to look at the foreign exchange rate, or the equity on our homes. Knowing who I was and what I used to do for a living, they came to me with questions, thinking that I could solve this as easily as I could solve a budgetary blunder, but I had no answer to calm their nerves and I was too exhausted to innovate creative lies. The next morning, many saw that the water gauge was up a few more meters and threw themselves off of the cliffs behind the boulders of the mountainside, but what did their suicide mean except for more food for the rest of us. I gazed out over what remained of the world where there was nothing more than the tops of mountains peeking out of the vast and infinite expanse of water, rigid clusters of land peppering the map in seclusion from each other with the remnants of mankind flocking to their peaks to stay alive. There were fires and altars, sacrifice and worship, ashes and blood, but the water continued to rise. Who was the god of the madman who swayed with the animals while we jumped into cauldrons of fire? We were all too afraid to say aloud what we inwardly asked ourselves, even in the thrall of despair, because our only hope was that our gods, whose names we praised all our lives, would eventually make sense of this madness and liberate us, but they did not, and it took maybe the entire course of the world’s destruction to realize how far gone in a fantasy we had been all those years. Our naivety betrayed us, just like our teachers. Soon came the thirty-third day of the waters and the third day of being on this ephemeral mound of earth that had since come to be crudely known as “Carcass Rock” after the bodies of all those that had perished began to wash up in the waves against the base of its cliffs, the empty shells of man and beast piled together like creation in chaos. In and amongst the shattered bones, the dampened limbs and the torn wings was a shrill cry that was heard by a couple women who said that it was unmistakably the ancient voice of Kadaskael, through whom we first learned how to sophisticate our weaponry and exceed in the art of bloodlust. Long ago, he turned our staffs into swords and our swords into firearms. He showed us where to mine deadly metals and dreaded elements that all nations would fear for what we could make of them. He tweaked our levers and made buttons that could deal the destruction of the cosmos with a single touch, buttons that now lie deep below our sorrows in the debris of a city overruled by mud. Each day on Carcass Rock, another fourth of the ground disappeared. The stench in the air thickened with each wave that rolled the remains of the dead up by our feet. We had prepared our vessels and planned to launch for the next transient settlement that we could find within the next day, but our time was abruptly cut short when a crack of lightning struck our camp and set the tents ablaze in a relentless fit of flames. Me and one of the board advisors of the royal administration, named Corcoi, desperately got into our vessel and began rowing through the floating pile of festering flesh to escape the clutches of the conflagration with our lives, as did many others with us, but not everyone had the same haste in their step. The pouring waters from above were not enough to stop the flames from taking hold of everything beneath the canvas tents that we had kept so warm and dry. In that hour, those who had less fled with their lives and those who had more were lit into a living cinder for having gone back to gather their possessions. The next class of goners were those who tumbled down the hill with bags full of food and supplies, filling their vessel with beyond what allowed them to get as far as ten feet from the shore without tipping over and drowning with the blanket of corpses that surrounded them. Our teachers had told us that it pleased the gods to value our market, to love our possessions and define ourselves by the affluence of our business, lest we would be nothing in their sight. But, what does it all matter now? There had been Samamoth lurking in the waters with the floating carcasses, and when they smelt the fresh food that some of the survivors were salvaging in their vessels, those vessels were viciously attacked and the people in them became inseparable from the rations of food that they were carrying. I didn’t dare look back at the blazing summit as it cast an infernal glow over the wailing slaughter in the waters behind me. Corcoi and I didn’t exchange a word. We just rowed and rowed until we couldn’t hear the wailing anymore. In the gloaming of the thirty-sixth day, once everything in the world became like a hundred shades of the same blue, our vessel began to catch a current. A distant earthquake had ruptured open a deep pit in the earth and exposed a radiant river of fire far below the surface of the waters, which aroused a two and a half mile-round vortex. The wide, whirling forces of the currents were slowly dragging us inwards towards destruction when, suddenly, our vessel struck the side of a rock and tossed us against a rigid formation in the midst of the waters. It took us a few moments of delirium before realizing that we had just crashed into a short series of rocks that were thrusting out of the water like the basaltic teeth of a sunken giant. The water was only up to our knees after the remains of our broken vessel had washed away with the current, so, before it could disappear beneath the waves, we decided to take advantage of this turn of fortune and follow the rocks towards what appeared to be a glistening dark mass emerging from the fog ahead. What we were arriving at was the height of Mount Ninmahai. Like all of the other mountains, it too had slowly been drowning to the point where all that was left of it by the time we had arrived was the crumbling remains of a temple strewn along the side of its peak. Graven gods of sandstone and granite gave toothy grins to Corcoi and I as we trudged through the water to reach solid ground before it became too deep to tiptoe. The wreckage of other vessels like the ones we had arrived in were visibly scattered across some of the closely neighboring remnants of land around us, undoubtedly some more forlorn fools who washed up in the storm, possibly the group of women from Carcass Rock who got separated from us after the fire. The worst part of it all had nothing to do with the uncertainty in whether or not the others had survived. It was the moment when we first pulled ourselves up onto that rocky slope, looked around with our feet on the ground and realized that this rapidly sinking chain of hills that used to be our mightiest mountain was now the last speck of land on the face of the planet. If the others weren’t here, they were nowhere. We quickly made our way over to what remained of the temple, a dilapidated house that used to facilitate spiritual meditation, that is until the division between science and religion became so indistinct that the two became one in the same and the place of worship turned into the place of analysis. Where there used to sit scripture and scrolls laid charts and experiment logs, and where there used to stand altars hung Achievement in Physiology rewards. The whole place was sunken up to its windows, every last creaky wooden pillar of it. Even the interior had been hollowed out into one big room and converted into a tiding pool of debris by the relentless forces of nature. But, anywhere without the constant drumming of water on our heads was heaven to us, so we hopped into the shallowly flooded room and took shelter from the harsh conditions outside, keeping in mind that this momentary breath of peace would soon be overtaken by the rising water line in just an hour’s time. What we didn’t keep in mind was the fact that the temple had already been overtaken before we arrived. As we pushed our legs through the water in search of food, Corcoi hesitantly pointed out something that was floating next to us. The entire surface of the water was coated with damp sheets of paper from overturned bookshelves and historical records out of which he picked up a brutally torn shred of pink fabric with tiny floral designs spiraling over its threads. Only then did I immediately understand what had happened to the others who had landed here before us. It hadn’t quite struck Corcoi yet that we were being watched by a beady pair of eyes poking out of the water close by, so I withheld it from him until I could slowly tighten my hands around a hard plank of wood in the water next to my feet and brace for a sudden attack. The minute he commented on my unusually quiet behavior, the hidden Samamoth that had wriggled in through a hole in the corner of the room suddenly burst out of the water with a savage hiss and snapped at us with its long, scaly snout. The only reason that one of us weren’t immediately clamped in its jaws and dragged away to its razor-toothed offspring was because it stalled for a moment between Corcoi and I to decide which one of us it wanted more. I learned a lot about myself in that moment. Under the pressures of time and death, I made the decision process a little easier for the Samamoth and used the solid plank of wood that was in my hand to knock Corcoi over the head with, dashing out of the temple for my life as the ferocious dragon feasted on my friend of thirty-six days without a blink in its eye. I watch the last tree take its last breath with its virescent summer leaves now sitting an inch beneath the murky face of the waters. I’ve scoured these mountaintops with Corcoi’s blood on my hands for three days now, watching the water crawl up a little closer and limit my options a little more with each passing minute. There is hardly any food, but survival is no longer the concern. It’s strategizing the best way to spend my last moments. All I ever wanted was a pay raise, but all I got was soot under my toenails. I thought that disaster tales and horror novels were only for the fiction aisle, and so long as I held my sturdy, responsible government career, nothing could ever puncture my bubble, and certainly not the atmospheric barrier that had withheld the waters for two millennia. I thought that as long as I obeyed the rules and paid my taxes, the gods would think more of me than a dash of fish food. Who were our gods, anyways, that they would not even spare the royal family, or Semat and his monks, who devoted each new day to the proceedings of worship? It was they that received the benefactions of heaven and the templates of a perfect society through our divine teachers, yet it was the prophet from those damn posters that received instruction from the heavens on how to prepare for this aquatic holocaust. I never knew that Yazayel would allow us to be glamorizing our reflections in the mirror, gratifying our every impulse and living so deeply submerged in self-satisfaction under the banner of commonplace while we were so close to the end of all things. He had already let us drown in our own pleasures. The water was just an affirmation that we were all dead. My shoe snaps the head off of a worn effigy of our apocryphal fertility goddess as I search out steady footing to climb the crumbling blocks of Mt. Ninmahai’s bell tower, the last place left to hide as the water swallows up its last gulp of land below. The only thing left standing is this tall rectangular spire of bricks and one anguished little man scaling its ruined walls for just two more hours to figure out where everything went so horribly wrong. As I reach as high as gravity will let me go, I take hold of the ropes at the top of the tower and anxiously ring the massive iron bell in hopes that someone greater will hear what my feeble voice fails to say for itself, but the swiveling bell mechanism gives out strength at the seventh toll and crashes down through the middle of the tower where its sad resonance is muffled beneath the waves. As my knees lose strength and fall against the blocky stones in defeat, I marvel at how erroneous all of my schooling and university education had been, how considerably far from the truth my costly textbooks all were. I placed my trust in anyone with expensive credentials and every word of every page they ever wrote. I sold my allegiance to a company, a bank, a market, a government, a numeric system based on infallible formulas in buildings that have since become the playground of what is now a crustacean community center. Every computer that ever housed an important document is now a shell on the back of a hermit crab. Laying on my back to watch the water fall down and bury me one drop at a time, I reminisce on a time when my greatest trial in life was choosing which shirt to wear for Sunday night, or coming up with a believable excuse as to why I was late for work on Monday morning. I close my eyes and imagine that I’m back in the shower washing my girlfriend’s hair as the bubbles spiral down the drain beneath my feet. My entire life, I’ve lived in a dream. I might as well die in one. On the fortieth day of the waters, there were no waters. A shaft of sunlight creeps in through the clouds, waiting to sting my eyes as soon as they open. I squint through my eyelashes to immediately find myself looking at an array of vivid colors adorning the sky, which compels me to wonder which aspect of my profoundly corrupt life that I had just spent days evaluating was deserving of such a place in heaven, but this is not heaven, nor am I dead. The constant sound of splashing is mute against the cry of gulls chasing each other through the wind. The endlessly grey twilight is over and the boundless barrier of water has run its course with six feet left standing of my little stone fortress above the surface of a calm blue terrain as far as the eye can see. I drag myself over to the edge with no words to express my sudden joy as I watch a flock of birds dive into the water and catch their breakfast. Is it even possible? Have the gods really lent me a sympathetic eye and spared my life, or is this all still a part of my fantasy? My body is conscious, alive, and, strangest of all, dry. I stare down at the waters below and gloat at the hungry creatures circling the base of the tower who will never get to sink their teeth into my flesh and taste the blood of the man who escaped heaven’s wrath. The saturated shirt clenching to my body and the sodden shoes that squish beneath my step quickly come off as I embrace my just reward for the life that I had worked so hard for and laugh at the maniac who wasted a hundred and twenty years of his life building his method of survival. He probably sank with all of his animals anyways. If I’m alive, then his god must have been everything that we had said he was, the delusion of a wishful idiot. My feet break out in triumph and I leap to the sky with praise to the only living champion of nature and the only one left to call a “god”, myself. It was my own efforts that made it here, not the will of someone greater, but my will, the will to survive and lay my fingerprints on the foundation of a new world. The clouds that had for so long brought darkness and death to the inhabitants of the land finally part for the reemergence of the sun in a world laid waste beneath its absence. This is the first ray of warmth to acknowledge me in forty days. I hop to the side of the tower in excitement and curl my toes over the edge with outstretched arms, sucking in my first lungful of fresh air as the Adam of a new world, my face beaming right back at the sun. I’m alive and I can hardly believe it. Yazayel and the rest of our divine teachers will undoubtedly return to my aid now that nature has chosen its god. They will help me repopulate the earth once the vast expanse of water finally settles and the salivating Samamoth swimming beneath my feet have all withered along the barren stretch of desert in the aftermath of the flood. I will walk over the arid skeletons of a dead civilization as living proof that me and my children are the supreme authority of all the heavens and the earth. The wetness lifts off of my skin and the vapors are forgotten as quickly as my uncertainties about life. I then lift my gaze to the clearing skies above and squint against the sun to see one dazzling solitary teardrop come slowly descending down towards me from the heavens above, one last droplet of water squeezed out of the clouds to glisten in the sunlight as it dribbles down through the wind and falls straight into my left eye, blinding me with an unexpectedly cold spatter until I lose my foothold and tumble off the side of the tower where my destiny hungrily awaits me.